I had asked for five book recommendations, but Scott gave me seven to choose between, but that doesn’t really matter the important thing is that we inspire people to read these books. Nonetheless Scott told me that if we had to cut it to five we should cut out Hume and Keynes. 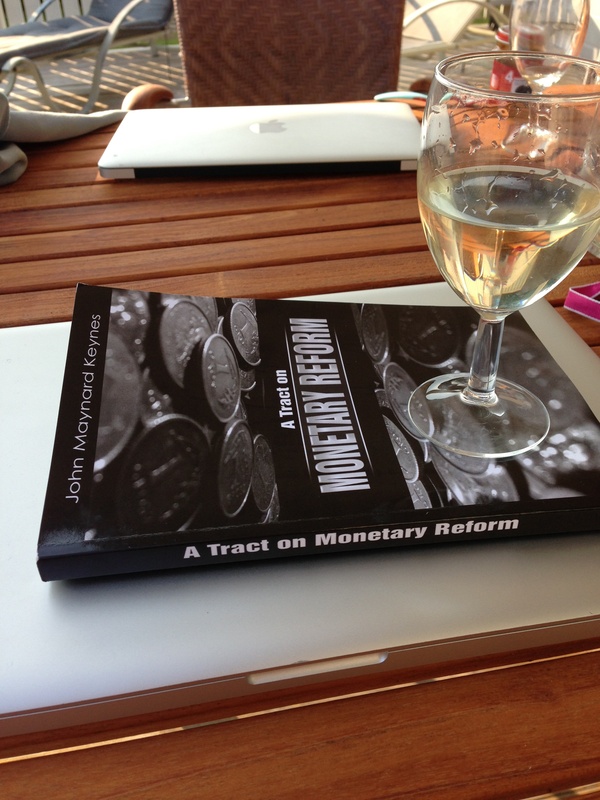 So my next step is not completely fair – I will focus on Keynes’ “A Tract on Monetary Reform”. The reason is that Tract is a popular book among many of the monetary thinkers I have surveyed and it is not only Scott who has it on his list. 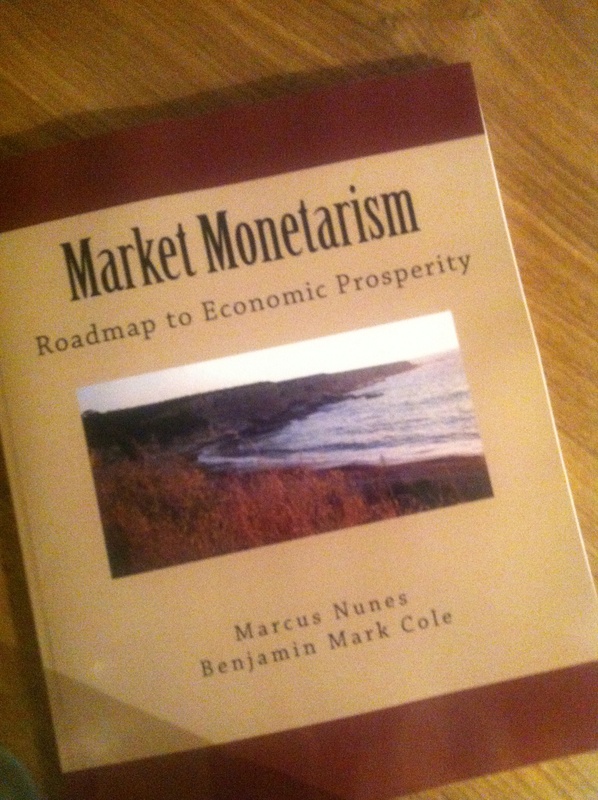 The reason I find it interesting is that Tract is really a monetarist book rather than a Keynesian book. Keynesian here meaning the Keynes is The General Theory – Keynes’ most famous book. In fact this is very much how Leland Yeager or Clark Warburton would explain macroeconomic disequilibrium – recession, deflation, inflation are results of monetary policy failure. It doesn’t get anymore monetarist than that. Brad DeLong in an excellent review of Tract from 1996 went so far as to say that it was “the best monetarist economics book ever written”. I wouldn’t go so far as Brad, but I certainly agree that Tract fundamentally is monetarist and that is also is very good book. 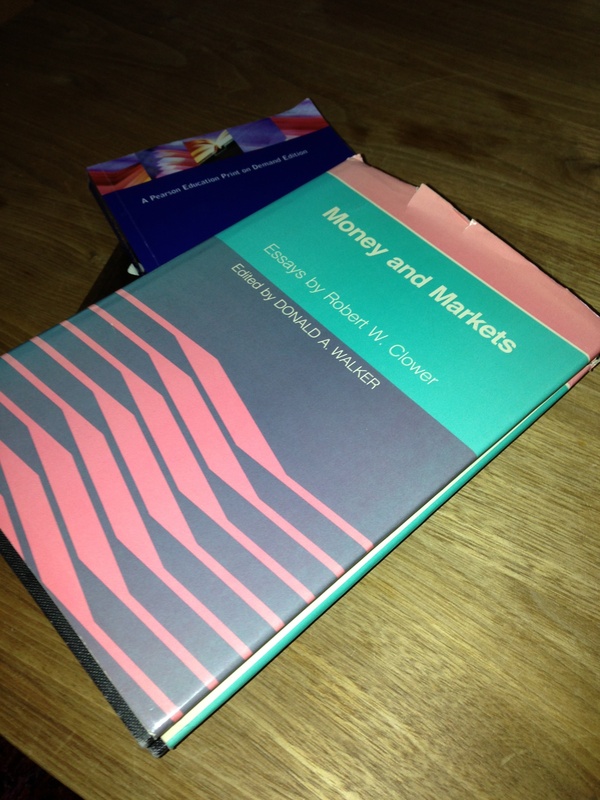 But it is not the best monetarist book ever written – far from it. In general I would very much like to recommend Brad’s 1996 review of the Tract. 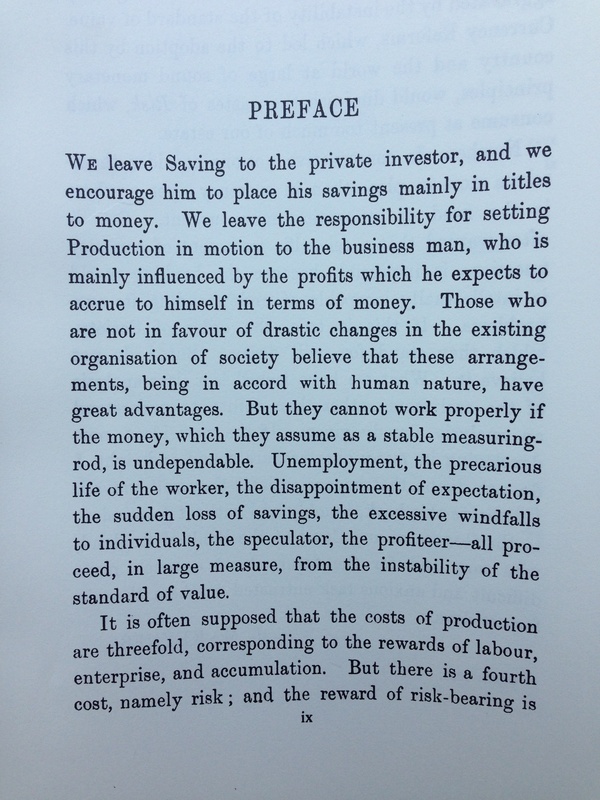 It covers all five chapters of the book and in my view gives a pretty good description of Keynes’ views from the period prior to he became an “Keynesian”. The overall message in the Tract in my view is that Keynes wants to demonstrate that if you mess up the monetary system you will mess up the entire economy. But if on the other hand ensures a stable and predictable – rule based – monetary system then the free market will tend to work well and the price mechanism will more or less ensure an efficient allocation of economic ressources. This of course has been Scott Sumner’s message all along. The Federal Reserve should conduct monetary policy based on – a predictable rule NGDP level targeting – and then the free market will take care of the rest. I find Keynes’ words from 1923 extremely suiting for the crisis of central banking today and even more suiting for Scott Sumner’s endless campaign to enlighten central bankers and the general society about the importance of proper “Monetary Reform”. In that sense Scott Sumner follows in the footsteps of the younger Keynes, Gustav Cassel, Leland Yeager and Milton Friedman in advocating radical monetary reform. 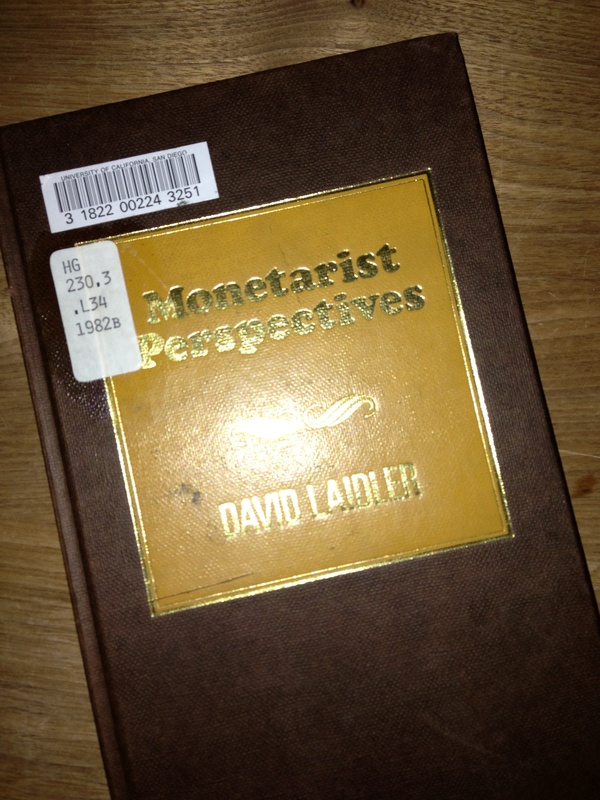 I am in the process of surveying a number of “monetary thinkers” about their favourite books on monetary matters. I hope to do a number of posts on the survey results. I had initially planned only to do one post on the survey, but I can see that there is material for a lot more. So I will likely do a number of posts on the topic in the near future. It is vacation time for the Christensen family – so I am a bit focused on reading books. Among the monetary thinkers in the survey are George Selgin, David Laidler, Kurt Schuler, Josh Hendrickson, Marcus Nunes, Tobias Straumann, Steve Ambler and Douglas Irwin and many more and more will follow. 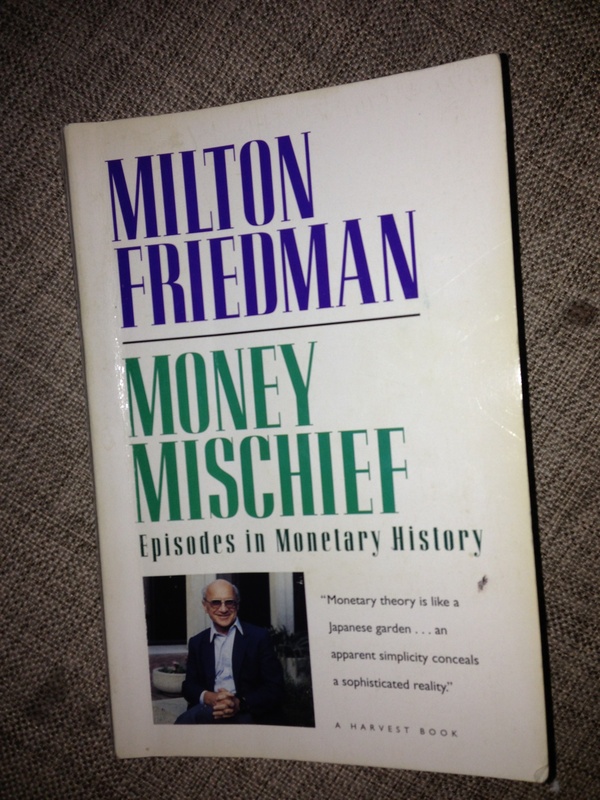 One of my own absolute favourite books on money is Milton Friedman’s “Money Mischief” from 1992. It is a collection of Friedman articles. Most of the articles are about episodes from monetary history. The book is extremely well-written and generally a very easy read. Money Mischief is being mentioned as an major inspiration by a number of the monetary thinkers in my survey. Josh Hendrickson calls Money Mischief “a great overview of money for non-economists and economists alike” and Douglas Irwin calls the book “just fun”. Both Josh and Doug have contributed to my survey and in later posts I will return to some of their other book recommendations. Money Mischief to a large extent is a inspiration for this blog as I always thought that I wanted to write a blog about different monetary episodes in the spirit of Money Mischief to illustrate my views on monetary issues and I had in fact originally thought naming my blog Money Mischief. Take for example Chapter 9 in Money Mischief – “Chile and Israel: Identical Policies, Opposite Outcomes”. In this Chapter Friedman describes how fixed exchange rate policies was a major success in Israel, but a failure in Chile. In the chapter Friedman once again spells out his general opposition to fixed exchanges, but he also acknowledges that fixed exchange rate regimes might work well for certain countries. Friedman mentions Hong Kong’s currency board as an example of a fairly successful fixed exchange rate regime. “Never underestimate the role of luck in the fate of individuals and nations”. And this is exactly what my survey of monetary thinkers is about – books that have inspired them and books that they think should be read by students of economics and money. 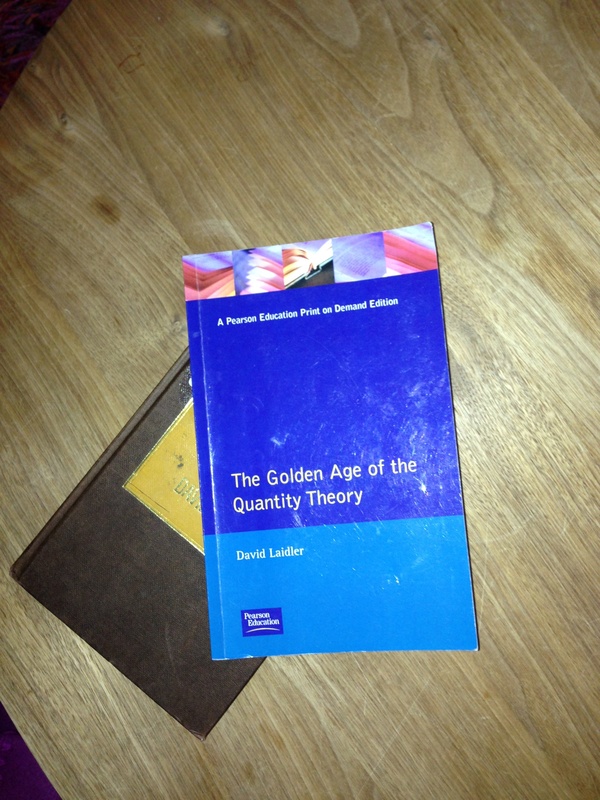 The survey has also inspired Kurt Schuler to reproduce his extensive reading list on monetary economics. You can see Kurt’s amazing reading list here. In the near future I will share more survey results. This is a picture of my own copy of Money Mischief – did you get a copy yet? Charles Goodhart undoubtedly is one of the leading authorities on monetary policy, theory and history in the world. So when he comes out and speak out against NGDP level targeting he deserves an answer. In his new article Central banks walk inflation’s razor edge on FT.com Goodhart speaks out against NGDP targeting. Unfortunately Goodhart comes across as being quite badly informed about what NGDP level targeting really is. Scott Sumner has already commented on Goodhart’s article and fundamentally agree with Scott’s reply to Goodhart. However, I will add a bit more in the form of some reading recommendations for Charles Goodhart. It is reading recommendations for some of my previous blog posts. Not all change, though, represents progress. Of particular concern is the increasing desire of officials to tie monetary policy to real outcomes. This is best exemplified by the instructions handed down on January 11 by Shinzo Abe, the prime minister of Japan: “We would like the BoJ to take responsibility for the real economy. I think that means jobs. I would like the BoJ to think about maximising jobs.” The Fed’s setting of a threshold for the unemployment rate, and the suggestion that the UK adopt a nominal income target, whereby real output growth and inflation get equal weights, go in the same direction. Goodhart should know that there is a fundamental difference between targeting real GDP growth or (un)employment and targeting nominal GDP. Any Market Monetarist would agree that it is highly problematic if a central bank tries to target a real variable. However, Goodhart very well knows that nominal GDP is not a real variable, but a nominal variable and furthermore NGDP targeting is not giving “equal weights” to inflation and real out. NGDP targeting is exactly about NOT even trying to determine the “split” between real output and prices. …I don’t think the Fed’s mandate is meaningful. The Fed should not try to maximize employment. In the long run employment is determined by factors completely outside of the Fed’s control. In the long run unemployment is determined by supply factors. In my view the only task of the Fed should be to ensure nominal stability and monetary neutrality (not distort relative prices) and the best way to do that is through a NGDP level target. Of course I would not have expected Charles Goodhart to have read what I have written about NGDP targeting, but I do worry that he is making his argument without having read any of the Market Monetarist bloggers. Had he done that then he would have known that NGDP targeting is not about targeting real variables – in fact it is quite the opposite. But observations of policy-making over the years raise doubts that an ad hoc entry into a new policy regime will be followed by a nimble exit when the appropriate time comes. The fear is that, once the sell-by date of these initiatives passes, central bankers will be acting contrary to everything learnt, painfully, in the 1970s. They will be relating monetary management to real variables on a longer-term basis. In the end, any short-term benefit will be dwarfed by the long-run pain as they push inflation higher in the vain pursuit of a real economic objective. I can fully understand Goodhart’s concerns about returning to the discretionary monetary policies of 1970s. However, what Goodhart seems to forget is that what we have had in the major countries of the world over the past five years has exactly been that – discretionary monetary policies. Neither the Federal Reserve nor the Bank of England have been following a rule based monetary policy. Instead monetary policy has been extremely discretionary. The same can by the way be said about the way the ECB has conducted monetary policy. NGDP targeting on the other hand would be a return to the rule based monetary policies of the Great Moderation. In fact Market Monetarists like myself are advocating that central banks basically are replaced by a Milton Friedman style “computer” in the form of a futures based NGDP targeting regime where the central bank will give up ALL discretion and simply let the price of an NGDP future determine the monetary policy stance. I dare Charles Goodhart to come up with any monetary policy proposal that is more rule based than that. Finally, I am happy that such a respected and insight scholar as Charles Goodhart has entered the debate on NGDP level targeting, but I also hope that he will give the idea a closer examination. After all NGDP level targeting as advocated by Market Monetarists is as far away as you can get from the discretionary paleo-keynesian monetary experiments of the 1970s. PS David Glasner comments on another Goodhart article on NGDP targeting. Alex Salter just sent me his latest working paper “Not All NGDP is Created Equal: A Critique of Market Monetarism”. I haven’t read the entire paper yet, but Alex is always writing interesting stuff – including as a guest blogger at this blog – so I want to share it with my readers already. Market Monetarism, with its policy rule of NGDP targeting, has in common with free banking that both seek to avoid monetary disequilibrium. One might conclude that these are different approaches to achieving the same end. The purpose of this paper is to show that the proximate ends are in fact conceived differently: Stable NGDP as an object of choice by a central bank is different from NGDP as the emergent outcome of the market process. Furthermore, well-known insights on knowledge, the pricing process, and the institutional context of economic activity suggest that this difference has important implications. I don’t have time to write a reply to Alex’s paper today, but hope to get back to it soon – or maybe some of my co-Market Monetarist bloggers might. But please have a look – it might be a critique of Market Monetarism, but coming from Alex it is always meant as a friendly critique.